CM: Petros Zoumboulakis had the privilege of meeting the poet Nikos Kavvadias (1910-1975) in 1962, at an age when he had retired from traveling. He owes this acquaintance to the poet's favorite niece, Elga Kavvadia, who was a fellow of the painter at the Athens School of Fine Arts. Zoumboulakis was one of the young painters, which Kavvadias sought to meet so that he may learn from them where contemporary art stood in Greece . As a matter of fact Zoumboulakis remembers when they were asking Kollias (his pet name) to narrate them about his travels, he would always change the subject and found the opportunity to ask about the novelties in art. Since a long time Zoumboulakis had wanted to create a post mortem portrait of Kavvadias - homage to an admired poet - but, considering the challenge overwhelming, postponed it. An opportunity arose at a homage on the occasion of thirtieth anniversary from Kavvadias' death at Chryssothemis Gallery of Halandri in 2005. There he did not present a portrait, but an installation with photographs and relevant artefacts to form a Kavvadian atmosphere. The present work entitled Watch of Nikos Kavvadias was created for the Silent Dialogs, the inaugural exhibition of the ACG Art Gallery of The American College of Greece in 2008. A great representative of romanticism, Kavvadias is inspired by a mixture of personal experiences and imaginative versions of reality and history. Seeking to represent a Kavvadian atmosphere, Zoumboulakis resorted to a painterly collage, with some affinity to the installation of 2004. 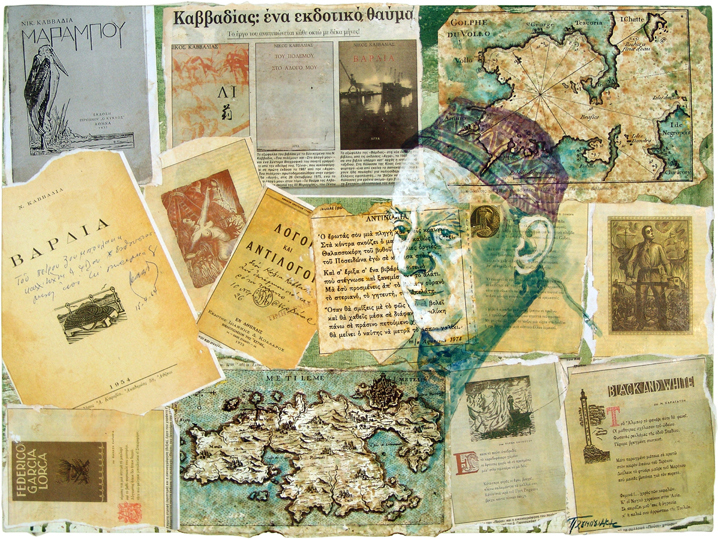 The collage includes printed material from the publications of Kavvadias' works, related press clippings and see maps. This material was reproduced from originals in the personal collection of Zoumboulakis. In this collection is included the first edition of the book entitled The Watch (1954), on which the poet inscribed a dedication to the painter in 1964. All the material has undergone a technique of aging - using color and fire - so that it comes to life. The maps are 'portolans' that is Venetian engravings for navigational use. The artist chose two maps of the ports of Lesbos and Volos that are old in order to infer to the archetype of the idea of navigations, which concerns the entirety of Kavvadias' travels in all the seas. These old maps, which underline Kavvadias' capacity as a sea wolf, communicate the sense of romanticism, the exotic quality that characterizes his poetry, which he conveys in the form of recollection, reverie and dream. They refer to scenes, visions and impressions that Kavvadias experienced and which feature like a barrage in his poems. In a key position on the picture, on the diagonal which links the two maps, Zoumboulakis painted in a transparent manner Kavvadia's face. As model he used the photographic Portrait of Nikos Kavvadias that Jannis Maillis took on 6 January 1975, on the day of the Epiphany. At the time Zoumboulakis met him, the poet was going through the mature period of his life. The painter rendered Kavvadia's face with a greater feel for psychology rather than realism. His gaze is intensely melancholic as if before him passes whatever he recalls, all his poetry and life. He seems to have himself become the hero of his poems. The white light accentuates the spirituality emitted by his presence. The painting is dominated by the color of the sea, which is at the same time blue, green and mauve. The background's oily green color resonates with the atmosphere of Kavvadian poetry and refers to - as the poet has written - the "dirty waters" of the ports, which is a color 'stained' by the feeling of what is seen for the first time or worth to be seen.